Are you living in Clovis, CA? Do you have a dishwasher which isn’t working properly? If yes, then Clovis Dishwasher Repair is here to help you. Our team has over 15 years of experience. Moreover, our licensed techs have all the equipment to repair your dishwasher in a short period of time. They will diagnose, troubleshoot and repair your dishwasher. Just contact us at 559 960 0798 or through our online scheduling service and we will be at your door in a short period of time. 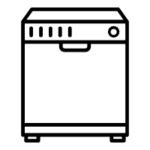 When should you contact Clovis Dishwasher Repair? Any of the following or other problems need our immediate attention. Keep in mind that Clovis Dishwasher Repair can fix every problem, so do not worry if the problem of your dishwasher is not mentioned. Dial 559 960 0798 and we will repair your dishwasher. Additionally, Clovis Dishwasher Repair can repair every type and brand of dishwashers. Some brands which we repair are in the following list. We provide all of the replacement parts in factory-new conditions and we also provide a 3-year warranty to all of the replaced parts. Our techs have repaired dishwashers for more than 15 years, this experience allows us to do reliable and high-quality repairs.